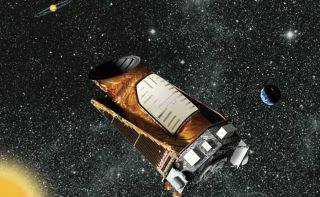 NASA will try to revive its ailing Kepler spacecraft this month in the hope of resurrecting a mission that has revolutionized the search for alien planets. Launched in March 2009, NASA's Kepler space telescope has detected more than 3,000 potential alien planets. But that exoplanet hunt stalled in mid-May of this year, when the second of Kepler's four orientation-maintaining reaction wheels failed, hobbling the spacecraft. "The engineering team has devised initial tests for the recovery attempt and is checking them on the spacecraft test bed at the Ball Aerospace facility in Boulder, Colo.," Kepler mission manager Roger Hunter, of NASA's Ames Research Center in Moffett Field, Calif., wrote in an update Wednesday (July 3). "The team anticipates that exploratory commanding of Kepler’s reaction wheels will commence mid-to-late July." Kepler spots exoplanets by noting the telltale brightness dips caused when they cross their parent stars' faces from the instrument's perspective. This is precision work, and the observatory needs three functioning gyroscope-like reaction wheels to stay locked onto its 150,000-plus target stars. Kepler launched with four reaction wheels, with one set aside as a spare. One wheel, known as number two, failed in July 2012. Number four then bit the dust on May 11 of this year, bringing the spacecraft's planet-hunting work to a halt. There's no guarantee that the recovery attempt will work, Kepler team members have stressed. If at least one of the two failed wheels cannot be brought back to life, the spacecraft will almost certainly be tasked with a new mission, probably one that incorporates more of a scanning approach (as opposed to Kepler's original point-and-stare operations). The $600 million Kepler mission has detected 3,277 alien planet candidates to date. Just 134 of them have been confirmed so far by follow-up observations, but mission scientists expect that at least 90 percent will end up being the real deal. Kepler's main goal is to help astronomers determine the frequency of Earth-like planets around the Milky Way galaxy. The observatory has already outlasted its prime mission life of 3.5 years, and mission scientists say they have enough data to keep them busy for the next two years or so, whether or not one of the failed reaction wheels can be brought back on line.